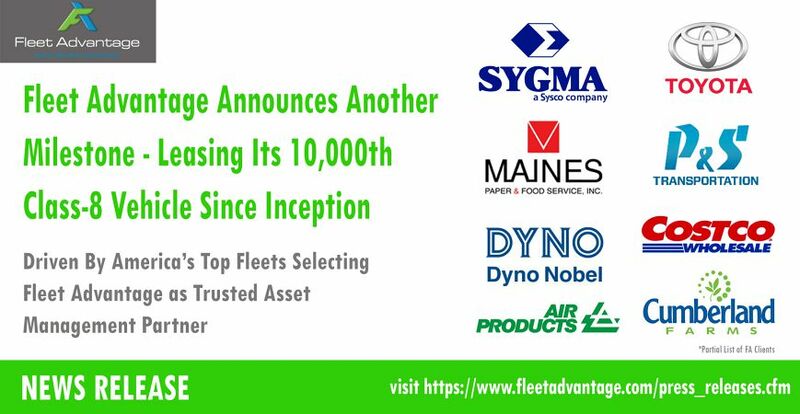 FORT LAUDERDALE, FL (March 13, 2018) – Fleet Advantage, a leading innovator in truck fleet business analytics, equipment financing, and lifecycle cost management announced today a new company milestone, leasing its 10,000th Class-8 Truck. In 2017 alone, Fleet Advantage placed purchase orders on over 1,800 new Class-8 Sleepers and Daycabs from various OEMs, valued at over $225 million. A key value add Fleet Advantage brings to its clients can be found in procurement strategy, equipment specification, delivery and remarketing. Customers benefit from long-standing program agreements in place with top lending partners that ensure they receive the most competitive cost of funds. Fleet Advantage then designs and orders the new equipment with National account support from several OEM partners and disposes of the used truck in the secondary markets at no risk to clients, creating a winning formula. Private fleets and for-hire carriers are adopting shorter asset lifecycle strategies by leveraging flexible lease programs driven by data analytics from Fleet Advantage that identify each truck’s “TIPPINGPOINT®”, the point at which it costs more to operate an aging vehicle compared with the cost to replace it with a new truck. Based on data analytics and comprehensive fleet studies, Fleet Advantage provides each client with a fleet modernization and utilization plan, projecting when aging equipment will need to be replaced. This approach is especially effective with fluctuating freight demand and the current booming economy as companies trying to acquire equipment solely based on demand are faced with equipment shortages and long lead times. “We’re extremely proud of this industry accomplishment as it validates the hard work from our dedicated employees, and it further proves the active shift in asset acquisition strategies and the importance of data analytics, as private fleets and for-hire carriers realize the many benefits of operating trucks on a shorter lifecycle,” said John Flynn, Chief Executive Officer at Fleet Advantage. Fleet Advantage serves America’s top truck fleets and guarantees the absolute lowest cost of operation by providing truck leasing and matching proprietary data driven IT processes with fleet analytics using the latest eco-efficient clean diesel technology to achieve optimum vehicle productivity, while reducing operating costs. Fleet Advantage is ranked as one of the fastest-growing privately held companies in the state of Florida and the fastest growing independent truck lessor in the U.S. In 2015 and 2013, Fleet Advantage was also named to Inc. magazines’ 500|5000 list of fastest growing companies in the nation. In 2011, CEO John Flynn received the Ernst & Young Entrepreneur of the Year® 2011 Florida - Emerging Category award.